At a Death Café people drink tea, eat cake and discuss death. Our aim is to increase awareness of death to help people make the most of their (finite) lives. 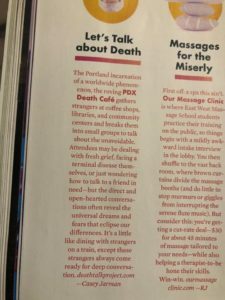 PDX Death Café is part of an international movement. Visit DeathCafe.com to learn more and search for a Death Café near you. Check our Facebook page for the schedule of upcoming Cafes in the Portland metro area. No upcoming Cafés close to you? Attend a virtual Death Cafe, offered monthly by End-of-Life University. What’s it like to attend a Death Cafe? Death Cafe is a chance to discuss whatever is on your mind regarding death. Discussion is 100% participant-generated. There’s no agenda or curriculum. Discussion takes place in small groups with a volunteer facilitator. Read more testimonials and news coverage of PDX Death Café. View Why I Talk About Death, a short film by Kate Brassington, the very first person to contact PDX Death Café about getting involved. In early 2013, three colleagues met to explore a collaboration that would engage the community in talking about death. 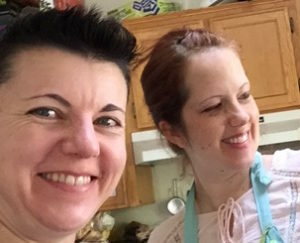 Life-Cycle Celebrant Holly Pruett, then in training as a Home Funeral Guide, had heard about a new conversational format that had just come to the US from England. Hospice Chaplain Don Tarbutton and Family Funeral Guide Nancy Ward were game to give it a try. Holly recruited the iconic Bijou Café as our first location. We put up a Facebook page and welcomed other volunteer facilitators. Next thing we knew, over 100 people were expressing interest in attending. PDX Death Café has been acknowledged as the largest in the world, with over 2,400 people on the notification list. Local popularity of PDX Death Café led to the organization of a day-long event, Death:OK, the predecessor for the Death Talk Project. In the three years from April 2013-March 2016, Holly organized or supported 36 Death Cafés in locations including restaurants, libraries, hospice programs, community centers, college reunions, and even a music festival. These Cafés are possible thanks to the volunteer efforts of our table facilitators and the generosity of our host locations. 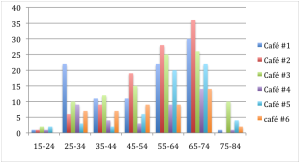 Participant age cohorts across our first 6 local Cafes. See above for locations. Cafe #5 was held over dinner at the West Cafe. Cafe #6 was hosted by Portland’s LGBTQ Center.